We recently made an extraordinarily productive and enjoyable trip to Canton, Ohio, where we attended the annual picnic of the town’s Spanish community. The Spanish folks there were incredibly hospitable and generous, and we were able to gather tons of information and interviews, stories and images, all of which will help us reconstruct more fully the history of Spanish immigrants in that part of the country. Special thanks to Laura Goyanes, of Cleveland, who organized the overall trip for us, and to Chris and Mike Vega, who were our invaluable contacts in Canton. There were well over 100 people at the picnic; the Spanish Club in Canton is doing a great job trying to preserve the legacy of their immigrant ancestors. 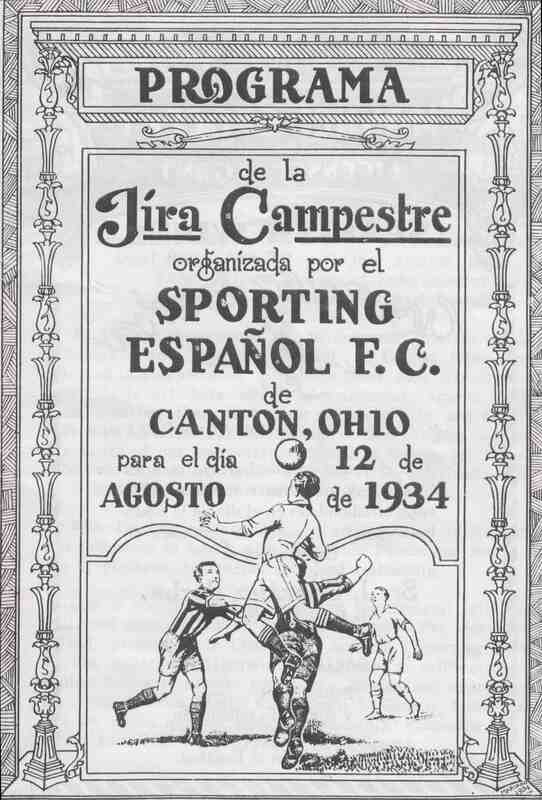 Among the jewels we were able to scan was this 16-page program from a 1934 soccer match and picnic held in Canton. Documents like these are goldmines of information, and they’re also a lot of fun to look at! Thanks to the Cabo family for preserving and sharing this beautiful document. This entry was posted in Ohio and tagged Canton, Ohio, Soccer. Bookmark the permalink.